Shunning the sweet and sticky glaze of typical Chinese chow, Nikola Sarbinowski embarks on a salt-fuelled feast in Southern China. Bulging eyes plead for mercy. I’ve caught my first ever bamboo worm in the trap of my chopsticks. Fried into crispy waifs, these critters are the Chinese version of beer nuts. I pause, surveying its lifeless body, and pluck up the courage gnash off its head. With bugs teeming in the humidity, it’s no surprise these protein-packed slippery suckers have wound up in sizzling oil and on the plates of hungry Yunnanese. I pluck my next victim from the pile. Its skin crunches under my teeth, leaving just an empty husk. I wash it down with a swig of Kingstar. This amateur foodie has arrived in the real China. Ditching greasy memories of sweet and sour pork and noodles slick in cardboard boxes, I find myself in Xishuangbanna in the south of the Yunnan Province. Far from Guangzhou and its sugar-swamped Cantonese cuisine, China’s so-called utopia is a land where salt and sour reign supreme. An evening snack of fried bamboo worms. Home to the Dai people, Xishuangbanna lures Chinese tourists with its muggy climate and the promise of elephants romping through tropical rainforest. To foreigners though, this ‘Amazon of the East’ remains a little-known lick of land, dipping between Myanmar and Laos. Keen to sink my teeth into the local culture, I join a cooking class run by Mi Wei An, the head Dai chef at Anantara Xishuangbanna Resort & Spa. Like any culinary journey, the class starts at the source: the local market in Menglun. Mi Wei An grew up nearby, learning to make traditional food with her neighbours before Anantara persuaded her to nourish their guests. At the market we exchange faded cash for a handful of yangmei, Chinese strawberries the size of lychees, with skin like a cat’s tongue. I scalp a rambutan, rubbing its waxy hair between my fingers as I munch on the translucent flesh. 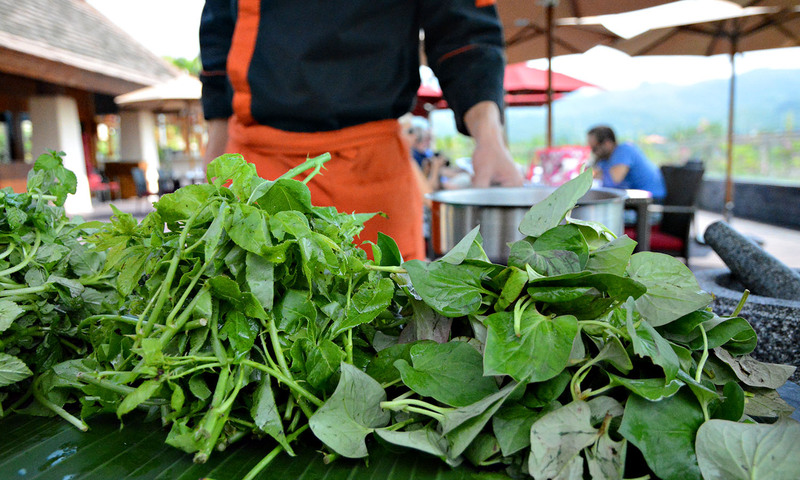 “Without herbs there is no Dai food,” a cook translates, while Mi Wei An describes the local fare. They point out a tangle of fragrant herbs on a table next to bulging melons and vegetables with tongue-twisting names. The prominence of water spills into their cuisine. My first Dai dish was strewn with moss plucked from the river, dried and pounded into sheets and then barbecued. But I can’t see any of this popular and surprisingly tasty snack at the market. Learning how to cook, Dai style. Fresh herbs at the ready. Chatter wafts behind loaves of pig’s blood and men hack at meat, their cleavers thumping into wood. A butcher heaves pork belly onto a metal dish and I salivate remembering the morsels I ate in Guangzhou. The best pork belly is said to have five layers of alternating flesh and fat topped with crispy skin. The Cantonese dunk theirs in sugar – a finale our chef would dismiss with a grimace. I pass a flock of leathery birds, gutted, splayed and skewered. With heads and legs still intact, they look like prostrate bats. At the next stall I paw a parcel of glutinous rice. Wrapped in banana leaf, the patty is one of the few sweets made by the locals. Our guide tells me they’re traditionally eaten at Dai New Year in April. After a nibble I suspect this bundle’s hung around since last year’s celebrations. Back at the hotel, we muster at our cooking stations overlooking the rust-coloured Lancang River, the northern arm of the Mekong, and a fitting backdrop for a Water Dai feast. Fishermen wade in the shallows as we set to work. For entrée we prepare a pork rib, basil and winter melon broth. My shoulders tinge pink as I dart between shaded stovetops, comparing the clarity of each broth and the texture of the melon. Our concoctions pale compared to Mi Wei An’s, and as she samples my soup she suggests shovelling in more salt than I’d normally dare ingest. Locals source their salt from a village in the mountains. Although they use a lot, it never goes to waste, Mi Wei An says as she tosses a pinch into her pot. Next we whip up a shredded chicken salad with tongue-numbing basil. The meat is bland and dry until we crush seasoned lime juice into the flesh with our fists. The battered dish croons with flavour. Ganba (dried beef) is delicious. We barbecue long, firm eggplants, the purple skin morphing to yellow then golden brown. I gobble the creamy flesh mixed with mint, coriander, chilli and garlic. Strips of ganba (dried beef) hit the flames before we marry the salted, slow-dried rump with a blend of local herbs in a marathon mortar and pestle mash. Preoccupied with the first four courses, I’m blind to the brewing clouds. As rain lashes the deck, the umbrellas offer little protection from the plump, tropical drops. It’s no wonder Xishuangbanna claims China’s crown for biodiversity. Lightning slices into the botanical gardens across the river and cooks swarm, whisking chillies, chopping boards and stoves inside. In true Dai style, our feast shuns sugar bar the boluo fan, glutinous rice with clandestine slithers of sweet pineapple, a staple dish of Dai gastronomy, which Mi Wei An serves as a delicious side to stir-fried lemongrass beef and banana flower salad. Later I head into town for a late-night snack. A round of baijiu (white liquor) melts some space in my stomach and I graze from the street stalls that have sprung up at the entrance of the market. I chew a curl of fried cowhide and raise my beer with a group of local girls, who, between giggles, welcome us to Menlung. Xishuangbanna is a gourmet’s paradise, and Dai food sure hits the sweet spot. Rinse the rice and soak it in water overnight. Strain rice and steam for 30–40 minutes, until cooked. Scoop the flesh from the pineapple with a spoon, leaving the skin as a bowl. Chop the pineapple meat, discarding the core. Mix the cooked rice, chopped pineapple and sugar together. Steam again for around 15 minutes. Fill the pineapple shell with the mixture, and serve. China Southern flies to Guangzhou and on to the Yunnan Province. 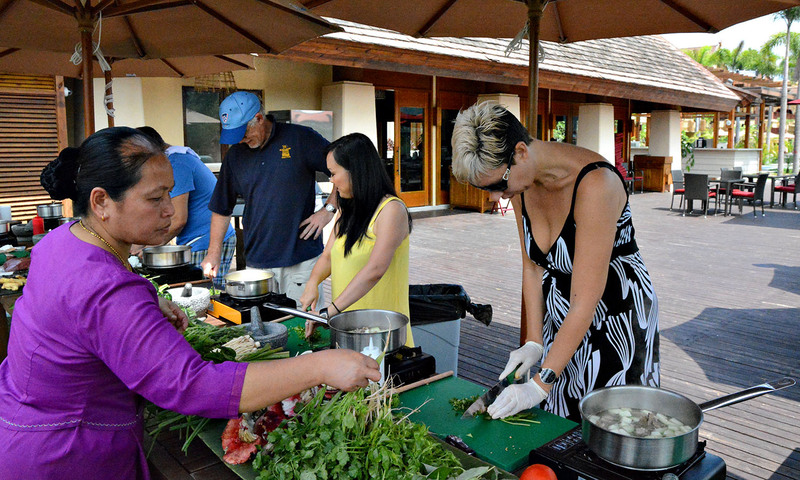 Join a cooking class at the luxrious Anantara Xishuangbanna Resort & Spa.